Location, Location, Location! 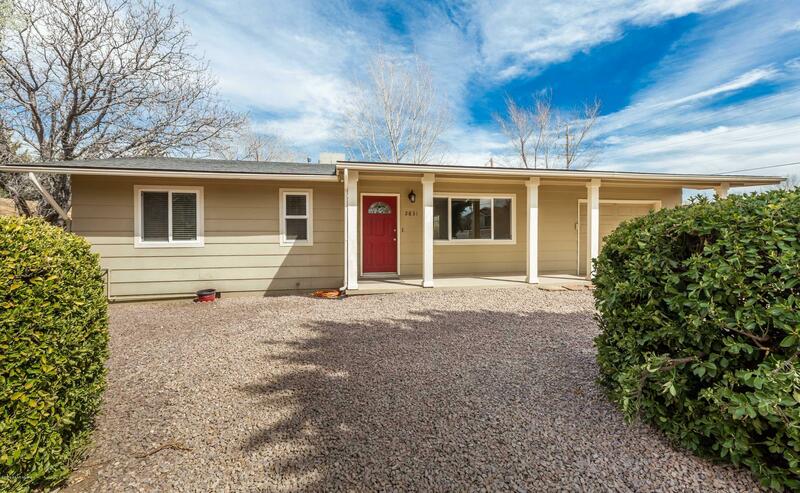 This Charming Remodeled Cottage is Conveniently Located w/Easy Access to Downtown Prescott, Shopping, Entertainment & Walking Distance to Watson & Willow Lakes! This Wonderful Updated Property Features a Comfortable 988+/- SqFt Floor Plan, Open Living Room, Classy Kitchen w/Refrigerator, Dishwasher, Microwave & Electric Range-Oven, Dining Area w/Access to Beautiful Backyard w/Grass, Fire Pit, Garden Area & Extra Wide RV Gate, Large Master Bedroom, Additional Good Sized Bedroom, 1 Full Bathroom (Remodeled in 2018), Attached 1 Car Garage w/Cabinetry (Great for Workshop). Upgrades Include: New Luxury Vinyl Plank Flooring, New Low Energy Windows, New Sliding Glass Door, Dim-able Lighting in Living, Kitchen & Dining, Wired Sound Throughout Home & Much More!